Looking for a totally out-of-this-world delicious and guilt-free treat? I’ve got you covered. These coconut bliss balls are made with 100% pure whole foods ingredients and are dairy-free, sugar-free, and gluten-free. But instead of focusing on what they don’t have, let’s talk about what they do — lots of flavor, satisfying sweetness, healthy fats, antioxidants, and anti-inflammatory benefits. So, so good! Use your hands to mold the coconut crumb into bite-size balls. They should stick together nicely. Place the balls on a piece of wax paper. Melt chocolate chips and use a spoon to gently drizzle the melted chocolate over each coconut ball. You want enough to fully cover the top and sides of each ball, but not so much that it makes a large pool around the base. 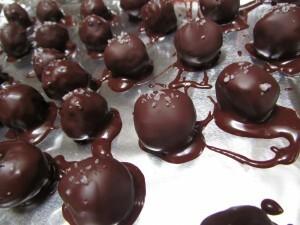 Sprinkle each ball with a bit of sea salt while the chocolate is still moist. Refrigerate the balls for two hours (to harden) and enjoy!